What canceled game do you wish had made it to release? Alejandro Jodorowsky’s Dune was a film too beautiful for this sinful Earth. In the ’70s, a group of artists, technicians, and filmmakers at the height of their abilities were collaborating on an art-house sci-fi acid trip that could have changed the face of filmmaking. Today, though, we can only look back at that project and wonder what might have been. Gaming may not yet have its Citizen Kane, but now it has its Dune: Silent Hills. 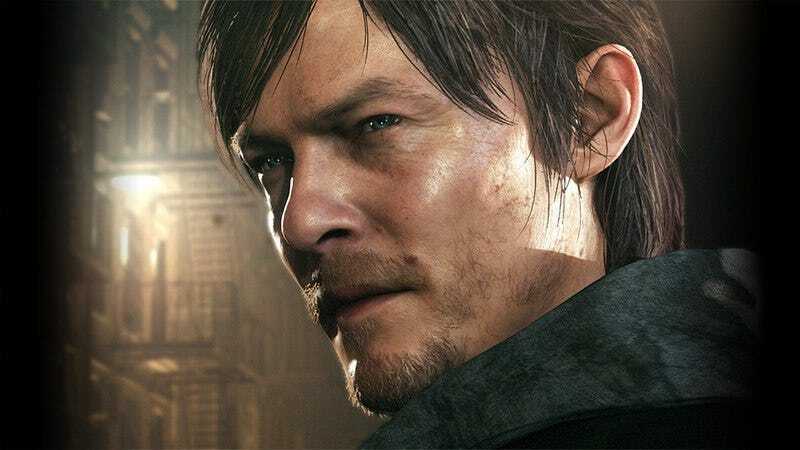 The greatly hyped but recently canceled project would have given superstar developer Hideo Kojima and horror darling Guillermo Del Toro creative control over one of gaming’s most prestigious series, with The Walking Dead’s Norman Reedus in a starring role. Silent Hill is in desperate need of fresh blood, and an all-star lineup like that could have breathed new life into the series. Instead, Silent Hills went the way of all flesh. I’m an enormous fan of everybody who was involved in this project, so I would give my left leg to have it see completion. What canceled game do you wish had made it to release? Koji Igarashi, the producer that shepherded the Castlevania series from 1997 to 2010, was on to something back on the PlayStation 2. Castlevania: Lament Of Innocence and Castlevania: Curse Of Darkness weren’t great games by any means, but they had that ineffable quality inherent in the series’ best entries. The muddy art and staccato thump of whipping mermen in Lament Of Innocence especially felt of a piece with the dank pixel gantlets in Castlevania III: Dracula’s Curse. Igarashi was finally getting it, bringing the old institution into three dimensions without sacrificing its inherent rhythm and heart. Whether or not the third time would have been the charm is going to be a mystery forever, because Igarashi’s next stab was canceled after a single teaser trailer was shown at 2008’s Tokyo Game Show. Castlevania Next Gen, a PlayStation 3 and Xbox 360 3-D game starring Symphony Of The Night hero and DeviantArt superstar Alucard, was scarcely a game at all before it got axed in favor of MercurySteam’s Castlevania: Lords Of Shadow. The latter game, released in 2010, wasn’t bad, but it was lacking in personality. Igarashi’s games, especially those weirdo 3-D ’vanias on the PS2, were rough but oozing with soul. It probably wouldn’t have been a classic, but I’d still have loved a chance to play one more 3-D Castlevania from a guy who really wanted to figure it out. Despite everything about Pirates Of The Caribbean: Armada Of The Damned that screamed, “Please, disregard me”—it was based on a declining movie series; its developer’s only other game, at the time, was the tepid 2008 Turok reboot—I found myself in love with the idea of it. Like most good movie games, it wasn’t a direct adaptation. Instead, Propaganda Games was borrowing the tone and world of the films to host a simple swashbuckling role-playing game. You’d choose one of two paths for your pirate captain at the start of the game, “legendary” or “dreaded,” and that decision shaped his initial appearance, reputation, and fighting style—both on land and sea. Much like the Fable games, though, your character’s look would become more pronounced as you continued to choose between respectable and dastardly deeds, and the Caribbean’s inhabitants would react accordingly. Especially in the wake of my beloved Fable II, this marriage of light role-playing and pulpy pirate adventures sounded like a great idea, but an idea was all it would be. Shortly after its reveal, Disney laid off a large portion of Propaganda’s staff, and Armada Of The Damned found itself in Davy Jones’ locker. A tiny part of my brain is permanently imprinted with Prax War, a late-’90s shooter led by a young man named Randy Pitchford. These days, Pitchford runs Gearbox Software, the successful studio responsible for Borderlands. But back then, Pitchford talked an enormous game for Prax War. The game’s squad of five commandos would work on their own, using smart AI to take out terrorist threats, he said. There would be enormous outdoor areas, but the most advanced driving physics ever devised would make getting around these places a joy. All of this would take place in a world that lived and breathed independently of the player, he said. In a world before the similar-sounding Halo or the seminal Half-Life, a shooter of this ambition was unheard of. Then Half-Life came out, and Prax War missed its deadline and was canceled. It’s been said that the game’s publisher didn’t believe Prax War could compete in a post Half-Life world. But Pitchford went on to work on fine shooter after fine shooter—including Half-Life: Blue Shift, where Prax War makes a quick appearance as a sight gag during the opening credits. I’ll always wonder if he could have pulled this one off as well. Blizzard’s canceled Titan project had obscurity on its side. By the time it was canceled in mid-2014, nobody had played a beta version, much less seen a trailer of it in action. The only information that dribbled out to the public was a handful of concept art and pie-in-the-sky ideas spouted by developers. Still, what eked out sounded intriguing enough. Titan was to be a massively multiplayer online game that took place on a near-future, post-apocalyptic Earth with three different regional factions warring over control of the planet after an alien invasion. That part sounds like a billion other sci-fi influenced games, but the combat portion was supposedly balanced with the depiction of a more ordinary life. Your character would choose a “day job”—something banal like an engineer, entrepreneur, or corporate drone—and had the option of ignoring the war to focus on your career or hang out with friends. If you did opt to fight, you’d suddenly switch your outfits Superman-style and trade your spatula or wrench for a gun. Two of my greatest gaming obsessions are World Of Warcraft and Vampire: The Masquerade, so I was really excited about the announcement of the World Of Darkness MMORPG. Spawned from the merger of Vampire publisher White Wolf and Eve Online producer CCP Online, the game promised that it would let you both just walk around looking like a badass vampire and plot to rule the night through political schemes. I dreamed of teaming up with the people I played the pen-and-paper Vampire with who had since scattered across the country. We’d carve up virtual space or maybe just have fun inevitably backstabbing each other for power. Instead, after nearly a decade of leading fans on, CCP first slashed the project’s resources and then finally abandoned it in 2014. Considering that even future editions of White Wolf tabletop games now feel like vaporware, it’s unlikely that I’ll get to live my dream any time soon. A long-abandoned dream of mine was finally fulfilled last month when a ROM of the unreleased Super NES title Sound Fantasy found its way onto the internet. Originally envisioned as a follow-up to Mario Paint, Sound Fantasy was a collection of musical trinkets controlled with the Super NES Mouse. Much like Mario Paint empowered players to make short songs and cartoons, Sound Fantasy would have encouraged players to interact with sounds in playful ways, transforming music into a toy. After the game was canceled, designer Toshio Iwai repurposed one of the title’s activities into SimTunes for the PC. The game’s spiritual successor, Electroplankton for the Nintendo DS, was the non-game that brought me back into the gaming fold after a self-imposed sabbatical, but I’ve hungered for years for this near-forgotten bit of harmonious bliss. The recently released prototype is nice, but it lacks one of the activities and a lot of the polish from the aborted version Iwai demonstrated in 2010 (seen above). The Wii remote is not a precision tool, often failing to properly register the more delicate maneuvers demanded by some Wii games. And therein lay the great promise of Project H.A.M.M.E.R. It made an appearance as a playable demo at E3 2006 and was never heard from again. You were a stereotypical power-armor-clad ambulatory pectoral muscle, and you hit things with your hammer. Any details beyond that feel utterly superfluous. What better use of the Wii’s limited capabilities could there be, and what more satisfying catharsis could be achieved than pounding robots flat with undisciplined swats of your flailing limbs? Whatever reasons Nintendo had for canceling Project H.A.M.M.E.R. are very good ones, I’m sure. The Wii was, and remains, a sweet testament to positive thinking. When Pandora shut the casket she was entrusted with after releasing all the evil in the world, only hope remained inside. Hope may not always bear fruit, but it compels us to keep striving forward. At times, the Wii feels like that empty box with nothing but hope inside. And my hope was for a chance to destroy evil automatons with a ludicrously big mallet. I think we can all agree that games can always use more Cthulhu. But for Headfirst Productions, it was all “Mo’ Cthulhu, mo’ green tentacle-beast problems.” Call Of Cthulhu: Dark Corners Of The Earth was released to extremely subdued acclaim in 2005 after a number of production problems and unforeseen delays. Most of the game takes place among the violent fish people of Innsmouth, where, as a private investigator, you try to stay alive and get to the bottom of a tricky missing person case. Matters escalate until, as all such stories must end, you pick up a Yithian energy weapon and help lead a military assault on Father Dagon and those Deep Ones messing around at the crossroads between this world and the next. It is a weird and difficult game, in the best sense. Headfirst planned on releasing two sequels, including Call Of Cthulhu: Destiny’s End. These never got made, though, and Headfirst went bankrupt. My working theory is that the developers abandoned work on the series after pledging their souls to Azathoth and Nyarlathotep. Either that, or they ran afoul of the Mi-Go or some Elder God. I was a lucky child, by which I mean I once owned copies of both Mega Man Legends and Mega Man Legends 2, games that are now considered relative rarities. I was also a foolish child. I sold them. I loved them and left them, which might be why the announcement and subsequent cancellation of Mega Man Legends 3 for the 3DS was so emotional for me. It promised to be a return to the airy, 3-D world that I found confusing and enthralling as a kid. The first two games felt like playable Saturday morning cartoons, and while the classic 2-D Mega Man games were always too hard for me, I was somehow down with the tank controls and clunky targeting in Legends. A return to that world would be a return to a time in my life I had left behind before I realized it was worth keeping, and the 3DS seemed a perfect fit for a game that always felt a little constrained by the PlayStation’s comparatively limited input options. Not to mention the return of Tron Bonne—actually, scratch all that. Capcom, just make a sequel to The Misadventures Of Tron Bonne. That’s what the world really needs.